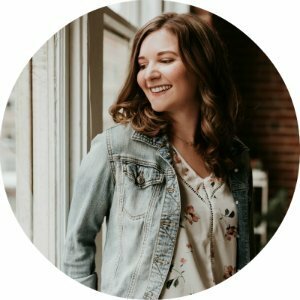 I talk a lot about mindfulness on my blog, but sometimes I feel like I’m only grazing the surface and not getting into the details of how I incorporate mindfulness into my daily life and how you can too! Recently, I’ve been sticking to a morning routine (shocker, I rarely stick to a routine) that includes meditation as soon as I wake up. The reason I’ve been able to do this has something to do with a little app called Calm, the tool that will help you meditate, relax, focus, and sleep better. 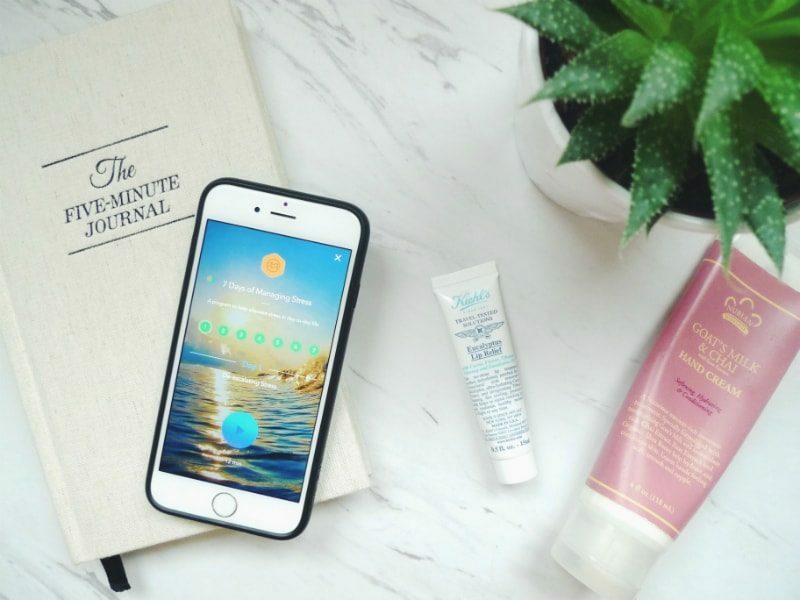 Now, I’ve tried a lot of free meditation apps since I first started meditating a few years ago, but there’s something about Calm that has made it really easy for me to stick with meditation every weekday morning. Whether you’ve never heard of Calm before or you’re already a die-hard fan, I thought I’d share my insights on the app and why I’ve become a loyal user. First things first, I always like to meditate in the morning because it sets an intentional and focused tone to the day. I neeeed that sort of tone for my day, let me tell you. 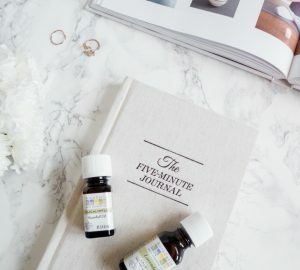 I used to dread meditating so I’d put it off for days, and weeks, and months, but since I’ve started incorporating Calm into my morning routine, it’s become something I do without thinking about it. When I first wake up in the morning, I check my phone quickly, drink some water, and then get right into the meditation before it’s too late (because I’ve probably hit the snooze button already at this point). The sessions only last about 10 minutes which is the perfect amount of time for me. Since upgrading to the Calm subscription (which I’ll talk about later), I’ve definitely been using the app more and feeling way calmer because of it. Seriously, starting my day with meditation makes me a lot less cranky. One of the features I love about Calm is the overall user experience of the app. As soon as you open it up, you’re greeted with soothing background noises and beautiful imagery. I start to feel more relaxed before I’ve even started meditating. You have quite the selection of meditations to choose from such as body scan and walking meditations, plus sessions on topics like loving-kindness and forgiveness. 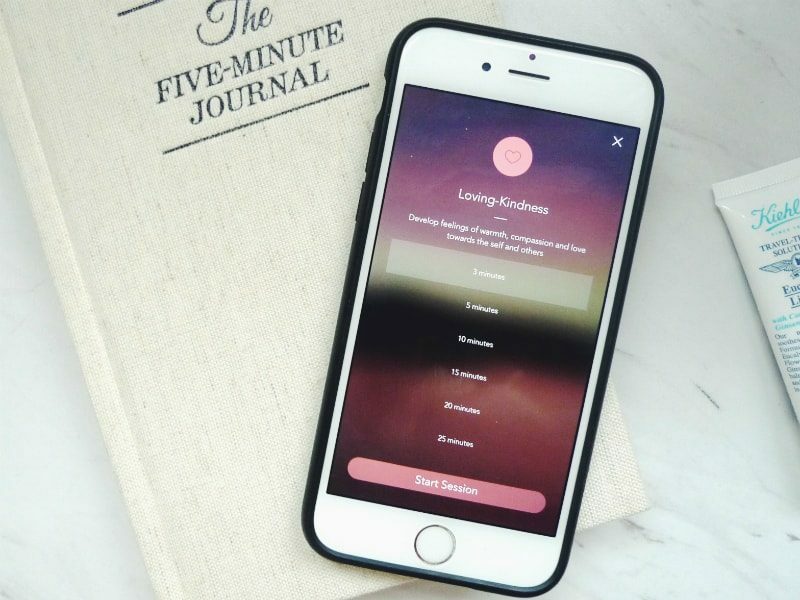 There are also Daily Calm sessions which offer you a sample from the paid programs on the app including choice, resilience, gratitude, impermanence, and letting go. I’ve done a few of their sleep stories too and I definitely think they helped me get to sleep quicker. With Calm, you have the option of doing guided or unguided meditations (for those of you who are mega experts at this meditation thing). One thing I’ll mention is that the guided sessions are lead by Tamara Levitt who has a beautiful voice, but obviously everyone’s preferences are different when it comes to the type of voice you want guiding you through meditations. Tamara’s voice is quite sing-songy which might not appeal to everyone. Then again, you might love it like I do. Once you’ve made it through a meditation session, you’ll see a calendar that shows you how many times you’ve meditated during the month. During the month of March, I meditated almost every day which totally blows my mind (and makes me wonder if my month was overly stressful LOL). Seeing how many days in a row that you’ve been meditating makes you feel like a bit of a badass when you’re on a 3-day meditation streak. Or maybe I’m the only person who associates meditation with being a badass? My love for Calm has reached the point where I decided it was worth paying the $12.99 a month to get all of the premium features. If you decide to upgrade (which is definitely not necessary, but I was sucked in), you’ll find awesome 7-day programs that focus on things like managing stress, finding happiness, improving your sleep, and getting focused. 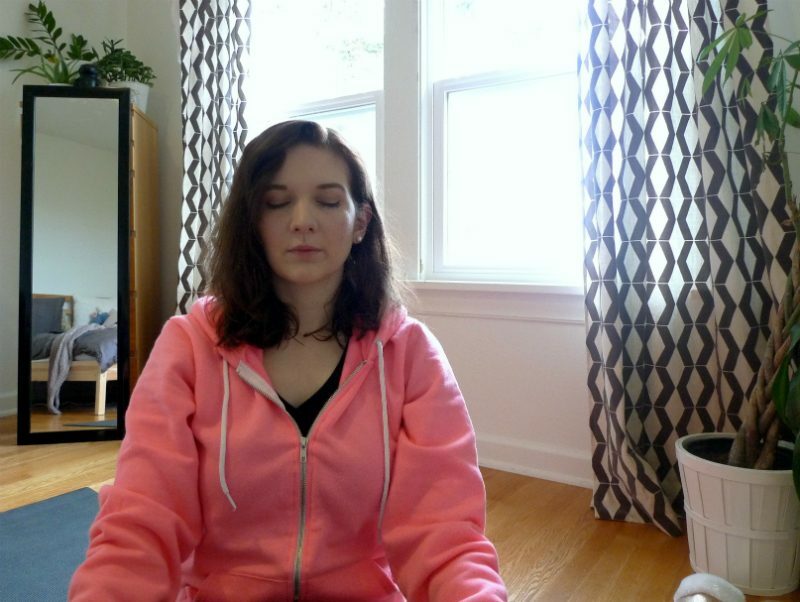 Having the subscription prevents me from getting bored because there are so many meditations to choose from that I’m rarely repeating the same session. Overall, I’m digging the Calm app at the moment for three reasons: the variety of meditation topics to chose from (stress, forgiveness, happiness, etc. ), the beautiful interface, and the calendar that shows you when you’re on a meditation roll. 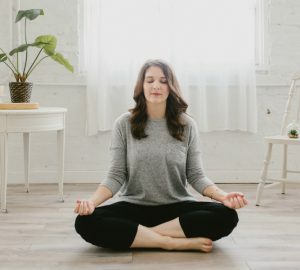 Whether you use the app for free or get the subscription, Calm has amazing options for anyone who’s interested in getting started with meditation and for those of us who have been doing it for a while (#meditationcrew). 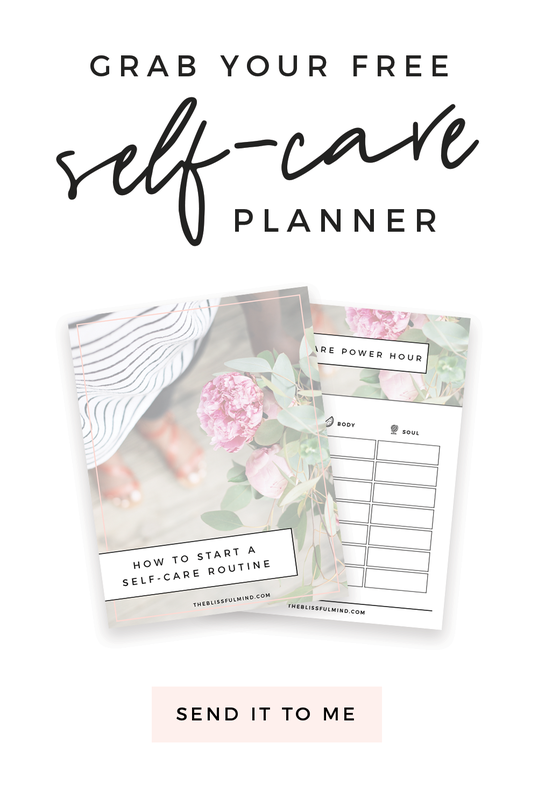 Want to try Calm for yourself? You can find it in the Apple store and Android store. What’s your favorite meditation tool? Leave a comment below letting us know what you use to meditate! 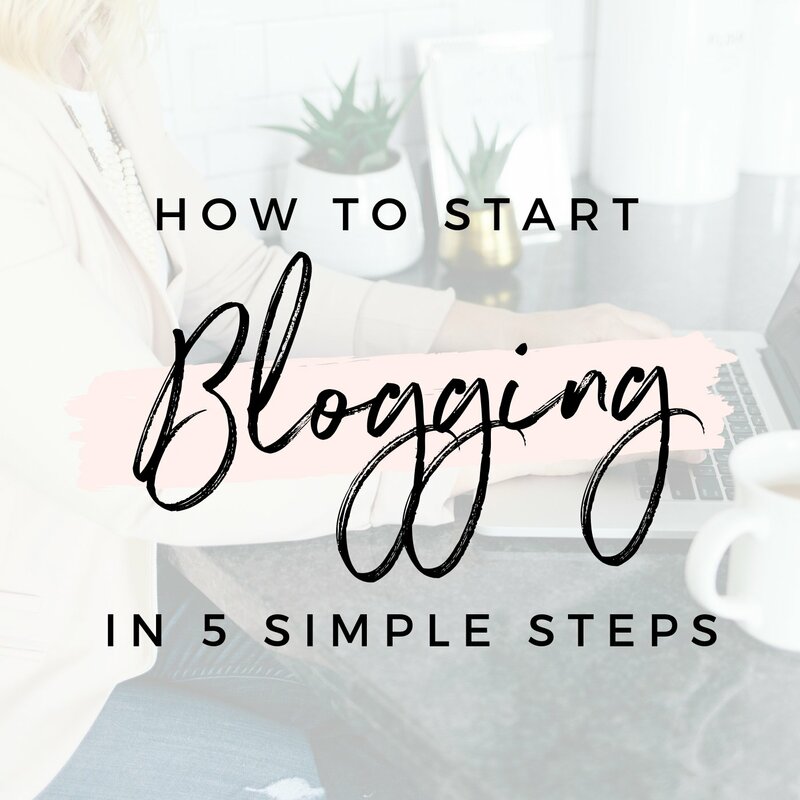 *This post is not sponsored, however, it contains an affiliate link. If you purchase a Calm subscription, I may receive a small commission. Ooh I haven’t heard of that, I’ll have to check it out! I downloaded this app a couple of weeks ago but haven’t used it. Thanks for the review, I will definitely give Calm a try. I am definitely going to check this app out! I have such a hard time calming my mind down to focus. I start doing it for like 60 seconds and then get distracted. Love how you can commit to it! Haha well I always get distracted when I’m meditating, but I think that’s okay! I find myself coming back to the moment and then having my thoughts drift off, and it kind of repeats itself. It’s all about that ebb and flow! I use a combination of three meditation apps, all for different things. My go-to is Headspace for more structured content, I LOVE the sleep stories from Calm, and I do Insight Timer for unguided! I honestly love them all. That’s awesome that you’ve found a use for all of them! I usually don’t struggle to fall asleep but if I do, I always put on of the sleep stories on! Thanks so much for taking the time to comment, Ayorinde! Mediation is key- Often times our mindset is holding us back to do achieve our goals! Learning about important strategies to set the stage for success in YOUR OWN MIND and you will become invincible- meditation is a great way to do this. Please visit our website (bSmartguide.com) and join our community, to find support, help and advise from great women who will inspire you to do the same ! Absolutely, our mindset either moves us forward or holds us back! Nice review Catherine! How would you compare it to headspace (if you’ve used that)? That’s what got me started. Now I use a combination of insight timer and youtube channels like MindfulPeace. I might give this a shot, thanks! Meditating is really the best way to start your day! You feel so much better and more productive for the rest of the day :) When I meditate I use an app called Headspace. Maybe I’ll look up Calm to compare them with each other. Been using this app for a week now.. It’s become my go-to to have a good morning and day. I have been using Calm and its absolute bliss… TOTALLY! I do my meditations unguided mostly (with the background music in the app), but in the past 7 days, I completed the “7 days of Gratitude” program and it just blew me off. Made me think how silly I was to miss all the beautiful things that I already have with me in my life when I was crying about how life has been crap for me. Two of those 7 day sessions, it got to a point where I automatically cried. I also use the “Gently Flowing Stream” background sound (for the first time today; earlier I was using Mountain Lake). Today I had the best experience with Gently Flowing Stream. The music was so serene and relaxing that I had multiple frissions (what we call as goosebumps). I just love the app! I tried Headspace for 2 days but I was not very impressed (to be fair to it, I was already a month into Calm by then). It just had 10 days of free content and even unguided meditations need unlocking (i.e. subscription). One great thing in Headspace is Andy’s (one of Headspace founders) voice. His voice was literally making me so relaxed that the first day, I went to sleep on it. He is Buddhist monk and surely has mastered stimulation by voice. I’d love to hear what you think if you give it a try! I’ve been using this app for almost two years now and I love it. Works for me. I go through stages of dedicated meditation and then have big gaps but I’ve been diligent again recently and just completed my 330th session. There is also an annual subscription offer that works out way cheaper than monthly. Thanks for the suggestion! I’m about to check it out. Ive been using Insight Timer for about 8 months. I can’t say enough about it. It offers guided of all shapes and sizes from some of the best including my fave, Tara Brach, a timer with bell and optional ambient music if you like unguided, forums to connect with like minded peeps, and a chance to rate and comment on meditations. It even offers uplifting podcasts that vary in topic. After you’re done, you can thank anyone from around the world who meditatated with you. Many more features but it’s fun to discover them for yourself. I’ve downloaded Insight Timer before but I’ve never really used it. I’ll check it out again! Thanks, Jonnie. I love the Calm app! When I first started my meditation practice, I constantly felt overwhelmed because I was just bombarded with thoughts. 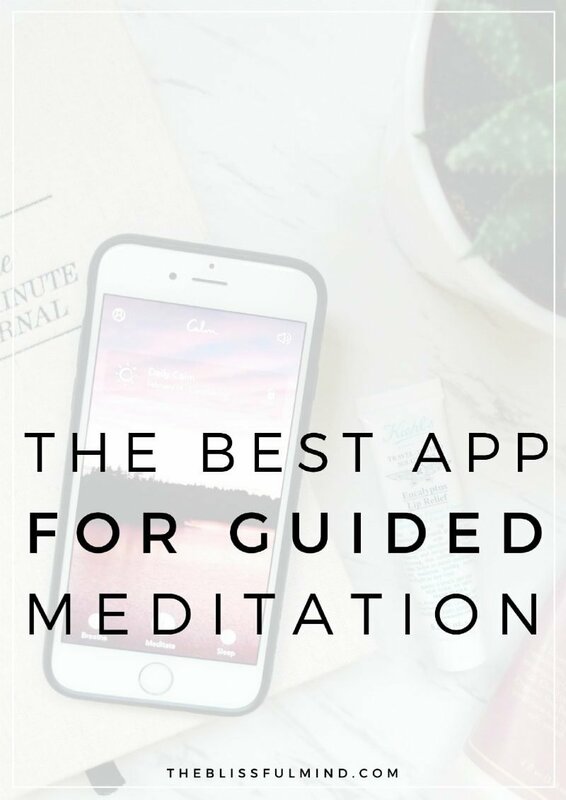 I had used other mediation apps in the past but the Calm app offered the most variety and just had a lot of different features that made it so user friendly! I love hearing that so much, Diana! It’s the one app I always come back too. Great post! I love using apps for better sleep. Thanks for sharing! 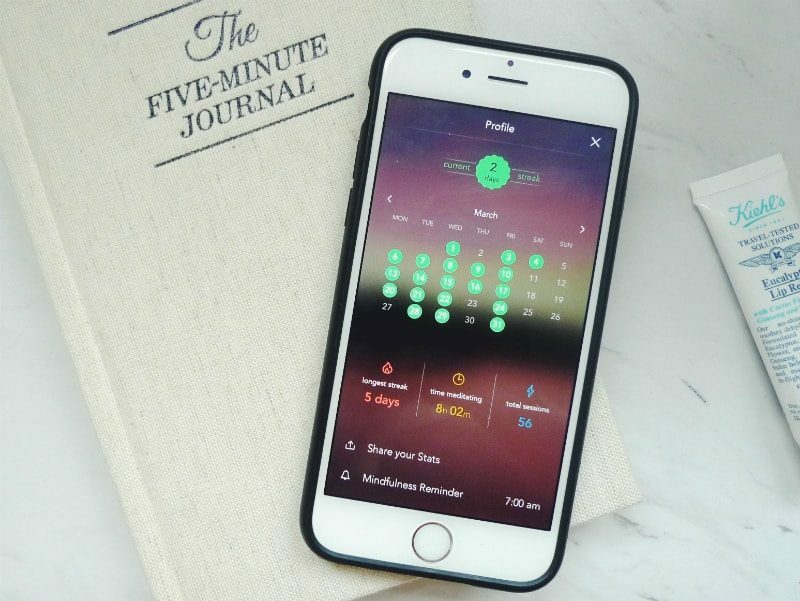 I read this post a while back, got the Calm app, and started meditating again. I’d used Headspace in the past and loved Andy’s voice/accent but I got out of the meditating habit and let my subscription die. I really like Calm much more than Headspace. I especially like the “rain on leaves” background sound and find it very soothing. The imagery is beautiful and the guided sessions helpful. I did the annual subscription to save a little money. It is interesting to see how people need a mobile phone even to meditate. I never knew of this app Catherine till I came across your blog. I think regular meditation is a great way to get back your calm. It also clears your thoughts and helps you see through clearly. Thanks for the share.